Get your creative JUICES flowing, with the Panasonic MJ-L500 Slow Juicer! I don’t know about you guys, but when I used to think about juicers and what you could use them for, I used to assume they were only for making odd green concoctions with veg and fruit mixed together in order to get your ‘5 a day’ or ‘7 a day’ (or whatever it is now) intake in one hit. I like apple and kale, but the thought of whizzing them all up together to make a juice just really doesn’t do it for me. I’d rather eat an apple and then have some Kale with my dinner later on or something, rather than having to down some green gloop. Personal preference, I know many of you probably love these healthy juices but personally, I really find them unpalatable. This was, however, until I heard about the Panasonic MJ-L500 Slow Juicer. This is the new kid on the block in the Juicer world. Most juicers whizz the fruit and veg up in a bit of a frenzy and leave you with a lot of waste pulp – which still contains lots of goodness which is now lost. This is where the Panasonic MJ-L500 is different. This Juicer doesn’t blend and whizz, it squeezes and compresses the ingredients which, in turn, removes as much juice and goodness from the pulp as possible. This means the juice you are creating has far more vitamins and nutrients retained in it compared to other juicers on the market. Another thing that is wonderful about this Juicer is that it has a Frozen food attachement so you can place frozen fruit and veg directly into it to make slushies, granitas and more! Slushie cocktails almost on tap?! What’s not to love?! I have been asked to write a piece for this Juicer and I have decided that I wanted to write a piece on the different, and maybe slightly more unusual, things you can make with your juicer to show you they are for far more than just making healthy juices. Top 5 unusual things to make with your Juicer! You could use your Juicer to make this deliciously refreshing Pink Lemonade! Just pop your Lemons and Raspberries in the juicer to extract all the juice and pulp, then follow this recipe I’ve found on the BBC Good Food website. Perfect as a refreshing tipple on a summers day and impressive to serve to guests at a BBQ, if the sun decides to show it’s face here in the UK anytime soon! Most of us know, at some point in our journey through parenthood, our kids will utter the words, “I don’t like that!” and turn their noses up at something they have previously eaten quite happily. My middle one did it with Bananas recently. He’s always eaten them and then, BAM! Out of the blue, he decided he no longer liked them. 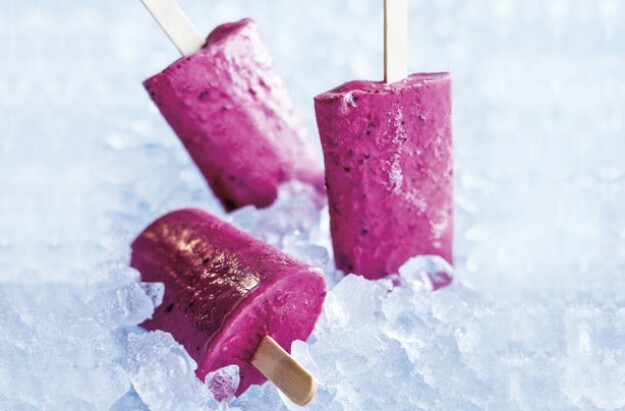 It can become very frustrating and a constant battle to get something good into them so, why not give these Fruit Smoothie Lollies a whirl?! You can smuggle all manner of fruit into these, as well as a bit of healthy dairy, and the kids are sure to love them! These lollies contain mixed Berries, yoghurt and Banana and you can find the recipe for them here on this website called, Good to Know. Almost all kids love Pasta, it’s my go to quick dinner for the kids if we are in a rush to get to a club or we get in late from somwhere. Packet and Jar Pasta sauces are convenient, but they are often full of hidden sugars and salt so why not have a go at making your own? Just fry some onion and garlic in a pan, throw some tomatoes and maybe a red pepper into your Juicer to extract the juice and pulp, then place all the ingredients in a saucepan and reduce down to make a thick and healthy base sauce for pasta and pizzas. It’ll also be quite a smooth sauce so great for fussy eaters. A bit of fresh basil thrown in at the end will liven it up a bit too. On a day out to visit an old ruined temple, we found a little van selling Lemon Granita and it was a taste of heaven. Cold, refreshing, zingy, everything our bodies needed on a sweltering day. Using the Frozen food attachement on the Panasonic MJ-L500, you can make a super easy and quick dessert for a dinner party, or just for yourself! Stress free and delicious! Just juice your lemons in the juicer, make the Granita syrup as per the recipe and then freeze in an ice cube tray. You can then pop the Cubes of Frozen Lemon Granita out as you need them and pass them throught the frozen food attachment, et Voila! 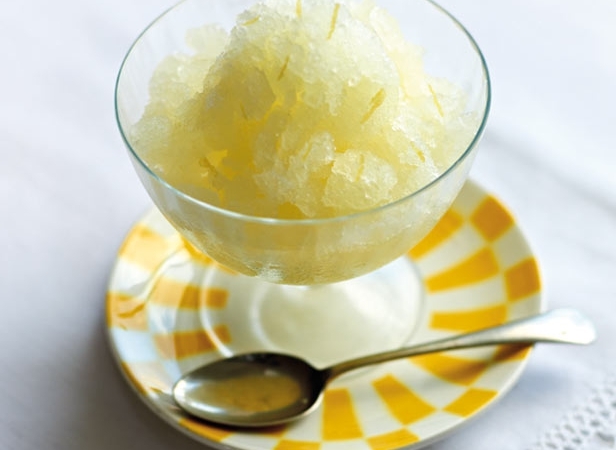 Instant Lemon Granita! You can find a recipe for Lemon Granita here. This is one of my recipes from my ‘Pick your Poison” section on my blog. Using some Frozen Pineapple Chunks, pop them in your Juicer and using the Frozen Food Attachement, pass them through it and into a cocktail shaker. Then just follow the steps as per my recipe for Pineapple Mojito Slushie recipe! You can find the recipe here! The juicer would be a brilliant investment if you’re really into your cocktail making. Some fresh peaches passed through the juicer would make a wonderful Bellini! This is definitely my favourite use for the Panasonic MJ-L500! I hope this has given you a few ideas as to how you can use your juicer. The Panasonic MJ-L500 looks like a super juicer, and would be a fab addition to any kitchen. It comes in 3 different colours to match your kitchen too! Do get in touch to share your recipe ideas with me via my Facebook Page! Disclaimer: This is a paid review. I have been asked to write this post but all words, thoughts and opinions are my own.